1. Amanita sp-T45, Big Sandy Creek Unit, Big Thicket Nat. Pres., Polk Co., Texas, U.S.A.
odor/taste The odor and taste of this species are unknown. The following material is derived from the collector's data and original research of RET. pileus up to 31 mm wide, white with dull grayish orange-brown to buff disc, broadly convex to planoconvex with low umbo, fragile; context very thin; margin striate (about 35 - 45% of radius); universal veil absent. lamellae free, close, off-white to pale cream in mass, unchanging, breadth not recorded; lamellulae truncate to subtruncate, with about one for every three lamellae. 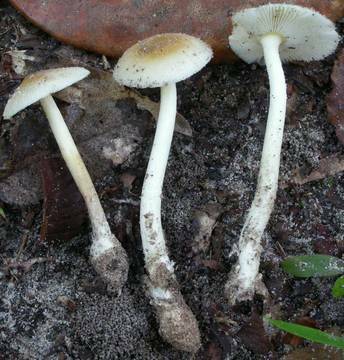 stipe up to 60 × 4 mm, white to buff, narrowing upward very slightly, fragile; bulb subnapiform to subfusiform; context mostly solid, concolorous with surface; exannulate; universal veil as limbate volva closely encircling base of stem, very fragile, white, of irregular height. basidiospores RET: [40//2/1] (7.5-) 7.8 - 9.9 (-10.4) × (5.2-) 5.5 - 6.5 (-7.0) µm, (L = 8.5 - 9.1 µm; L’ = 8.8 µm; W = 5.8 - 6.1 µm; W’ = 5.9 µm; Q = (1.36-) 1.38 - 1.62 (-1.65); Q = 1.47 - 1.49; Q' = 1.48), hyaline, colorless, smooth, thin-walled, inamyloid, ellipsoid to (occasionally) elongate, often adaxially flattened; apiculus sublateral, cylindric; contents monoguttulate with some small additional granules; color in deposit not recorded. ecology In small groups. At ca. 50 m elev. In sandy soil of hardwood dominated mixed forest by trail. material examined RET: U.S.A.: TEXAS—Polk Co. - Big Thicket National Preserve, Big Sandy Crk. Unit, Beaver Slide Tr. 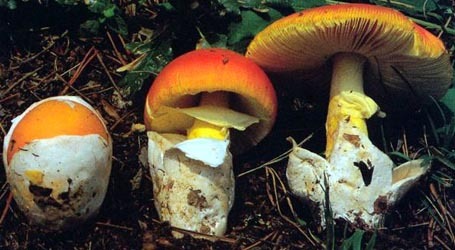 [30°34.500' N/ 94°38.535' W, 51 m], 22.vi.2012 Ronald L. Pastorino 6-22-12-A [mushroomobserver no. 98676] (RET 502-10).